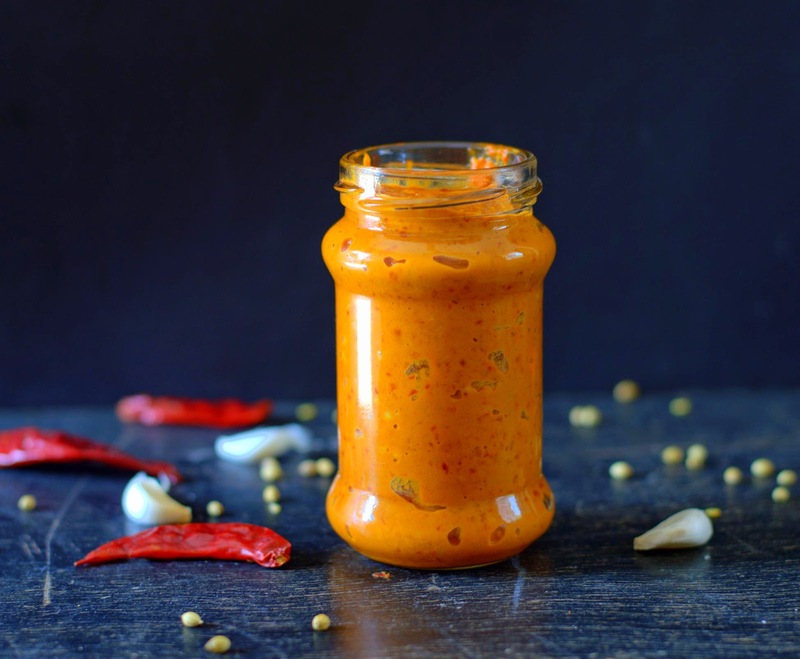 Cakes & More: Red Harissa - Fiery Versatile Goodness In A Jar! 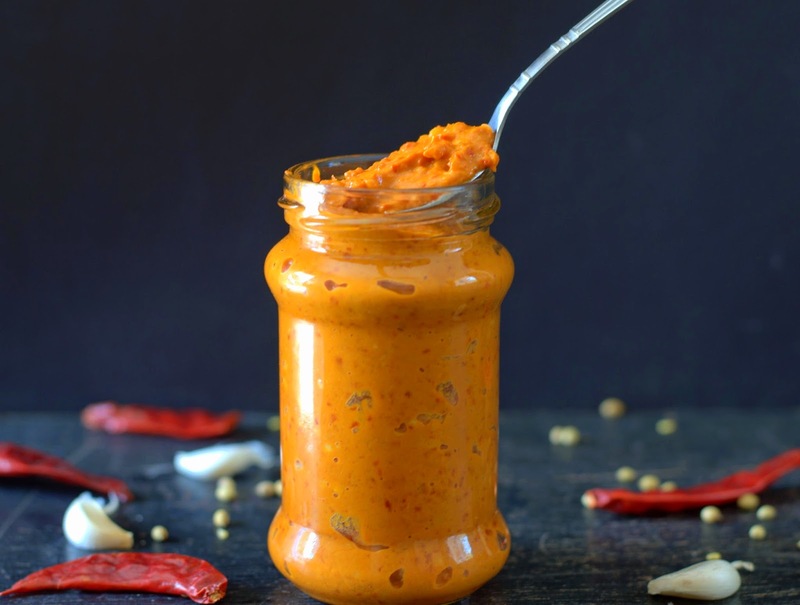 Red Harissa - Fiery Versatile Goodness In A Jar! I am one of those people who hit the supermarket or vegetable market when I can think of nothing else to do. Gives me a chance to pick up some staples while I browse through the shelves for anything new. And when I find these 'finds' once in a while it pleases me no end! Spotted these red chilies at Namdharis a few days ago . Vibrant, gorgeous stuff that makes spice accustomed, heat craving palates dream of all the things you can dish up with these. Pickles, sauces and dips on my mind as the salivary glands work overtime! And then it was time for some Red Harissa! This popular hot pepper paste is known for its versatile use in North African cuisine. 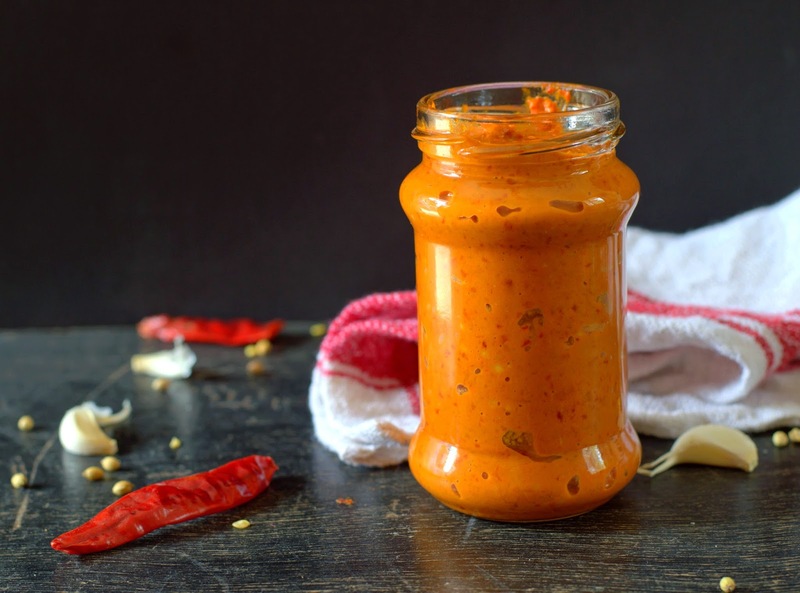 Most often made of a variety of red chilies, garlic, spices and oil, this paste is used for marinating meat and vegetables, in soups and even as a spread on pizza or sandwiches for the more adventurous. Want some extra zing in your savory dishes? Stir in a big dollop or a tiny spoonful or harissa! Harissa is really simple to make and can be easily tweaked to suit your heat and taste preference. 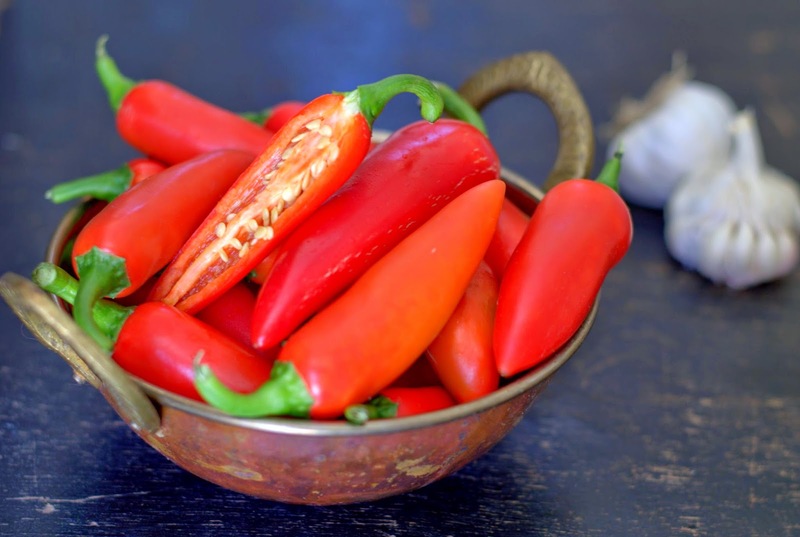 Recipes suggest using different varieties of dried red chilies, red jalapenos and roasted red peppers. You could alter the amount of dried and fresh chilies or simply use roasted bell peppers for a milder harissa. Fresh or dried herbs like mint and coriander, spices such as cumin, coriander, paprika, lime or lemon juice or sun dried tomatoes can be added. The paste can be refrigerated for a couple of weeks with a layer of oil on top. Here is how I made it. Please feel free to alter the recipe to suit your taste. Method : Soak the dried chilies in hot water for about half an hour. Roast the red bell pepper in a 200 C oven for about 20-25 minutes or till blistered and slightly charred. Once roasted peel the skin and chop roughly. Drain the soaked chilies, cut them into two. As you cut, be sure to drain any water which may have seeped in. Chop the fresh chilies into rough pieces. Take all ingredients except the oil in your blender . Process till smooth. Add the oil and process again. Carefully check the seasoning. Transfer to a clean dry jar, top with more oil and refrigerate till needed. Please note : Though the paste is quite hot especially when freshly ground, you can expect your grilled vegetables to taste less fiery. So maybe I will add a dash of red chili powder while grinding the paste if I will be using the paste in a marinade. Unless you want to eat it off the jar or on your toast or pizza , it may be a good idea to make it more intense as the flavors will be less assertive once the paste goes into a marinade or tossed into some noodles. The flavors though mature overnight. Be sure to wear gloves if you use contact lenses or have a little one around. De-seed the chilies and pepper for less heat. I have retained all the seeds. You can also add some tomato paste for tang and less heat. I added roasted bell pepper for the first jar. I forgot the it the next time, but liked the paste better without it. I made some Paneer Tikka using harissa in the marinade and it was delicious! I see myself making this paste often with varying flavors perhaps. With fresh red chilies available this time of the year, won't you make yourself some? Hot and fiery harissa, love it very much. the sauce looks fiery and feel liking reaching out through the computer to taste it. Have to make it as it will definitely go with a lot of dishes. I am hosting a diwali event, please do participate. Thank you. Definitely a nice recepie and a must try.Thanks for sharing with us.Should go well with nice and sweet dessert. try out sugarcraft and fondant cake at http://degree32studio.com.Worth trying all of them.